The Engineering Management Program focuses on developing an individual’s engineering, science and management skills so they can succeed in a technology driven environment. There is a growing need for engineers that can build multi-disciplinary design teams, then lead those teams to solve technical and business challenges. The Iowa State University Master of Engineering in Engineering Management Program is designed to train leaders who can meet both the technical and managerial challenges in developing modern complex engineered systems. The program can be completed on line or in residence, part-time or full-time. 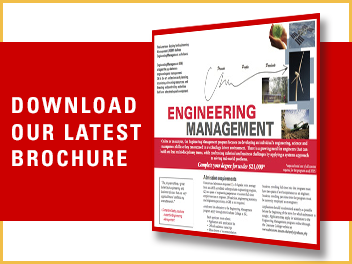 Why an Engineering Management Masters Degree? ISU’s Engineering Management graduate degree is often the best option for BS degreed engineers looking to get an MBA. While 5 of the ten courses in our program are selected from the MBA program at ISU’s world renowned business college, the remaining 5 courses in our coursework only masters degree are chosen from our Systems Engineering program. These are courses that cover topics in IT systems, Project Management, System Requirements, Operations, and Architecture definition, Quality and Ergonomics. These are courses more effectively targeted to the skills and background of engineers working within highly technical fields. The Industrial and Manufacturing Systems Engineering (IMSE) Department at Iowa State University strives to provide an outstanding educational experience for our students. We recognize the importance of “real world” experience, and most of our faculty have extensive work experience external to the university. Additionally, we solicit thoughts and inputs from successful personnel who are not working at ISU, but are (or have been) working in industry and are committed to improving IMSE student education. The Engineering Management Masters program is a 30-credit program which can be completed in as little as two years. Out of state students receive the in-state rate of tuition, and it is one of the most affordable programs available! Visit our tuition and fees page for details or call 515-294-7470 for more information. Unrestricted admission requires (1) a 3.0 grade point average from an ABET accredited undergraduate engineering program, (2) two years of engineering experience or current full-time employment as an engineer, (3) calculus, engineering statistics, and engineering economy. A GRE is not required for this program. Applications should be submitted as early as possible before the beginning of the semester for which admission is sought. Individuals may also take up to 9 credits at Iowa State as a non-degree seeking student and then transfer them to the program when they are admitted. The Master of Engineering in Engineering Management Program at Iowa State University is focused on supporting working professionals so teaching or research assistantships typically are not available. Note: Students typically are allowed to transfer up to 6 credit hours of non-ISU graduate credit into their degree program. Please see the Systems Engineering & Engineering Management Student Handbook for complete information.